Some of you might know that B and T goes to Mandarin class apart from their daily school. They really love their Mandarin lessons. Sometimes they sing Mandarin song at home.. Mommy just go lalala pretend to understand..
At the class, whenever they can memorise a Mandarin word in Chinese characters, they get to bring back the flash card for that word.. So far, Bella has these much of cards..
And last week, for the first time… Tasha got her flash cards!! Woohooooo!! I know it’s only two but at least she memorise those two words!! My little Tasha can memorise two Mandarin words!!! *happy tears* And this kiasu lady (a.k.a mommy) keep testing her at home, just to make sure she really memorise the words, not just by luck!! Hahaha..
Mommy is so proud of you, Little Tasha!! Posted on May 24, 2015 by Dr Halina Mohd YunosPosted in DevelopmentTagged education. Previous Previous post: Interesting App!! Next Next post: Cockroach Killer!! Will try to do that! Alhamdullilah… bagus b & t bijak. sy yg baca ni pun excited nk tgk pelajarn mereka sterusnya!! hope they will come is this video!! I would like to sent both my kids same as bella n tasha to mandarin class as well. Can u tell me where is it? Or recommend any good one? Googled but cant fine plus we thought want to sent them when they r a bit bigger but saw ur kids doing well and we thought y not..
– is it your kids went to mandarin class everyday? Miss Dorsett Pink.. They used to go to Mandarin daily for 1.5hrs in he evening but now we only send them 3 times a week to give extra time for Iqra class as well. They have morning school until 1pm. Then nursery/ iqra’ class until 4pm, then mandarin from 4-5.30pm. Yes.. And in top of that, Kumon after maghrib! Yes, they are super busy 😘 but they enjoy all the activities..
Looks like you gonna have a great mother-daughters bonding when you’re now officially their lovely-students…nice doc! That’s neat! I think I have to learn from your kids :p I only know basic Mandarin communication but I have no idea on how to read the characters. I am helping my son to learn basic Mandarin and Arabic but I’m afraid that he will be confused. 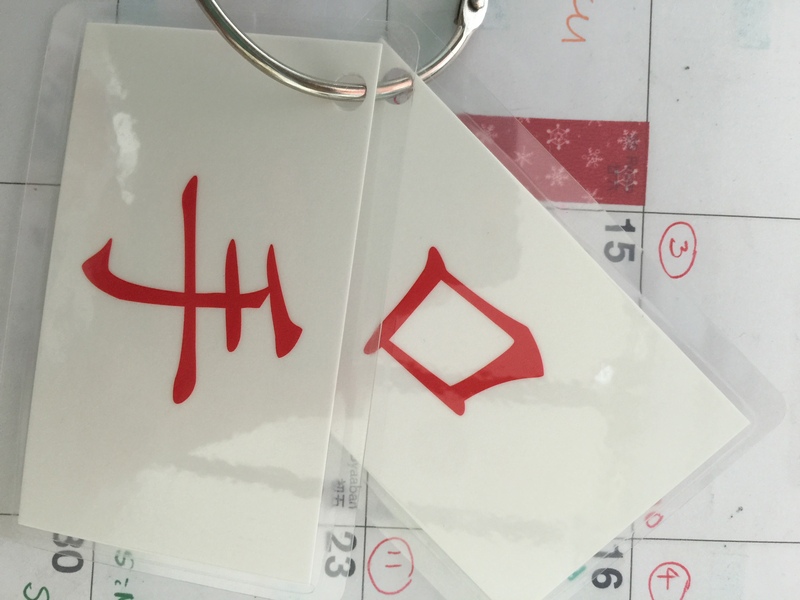 I have shared some basic Mandarin communication. Check it out Jom belajar bahasa Mandarin basic! . 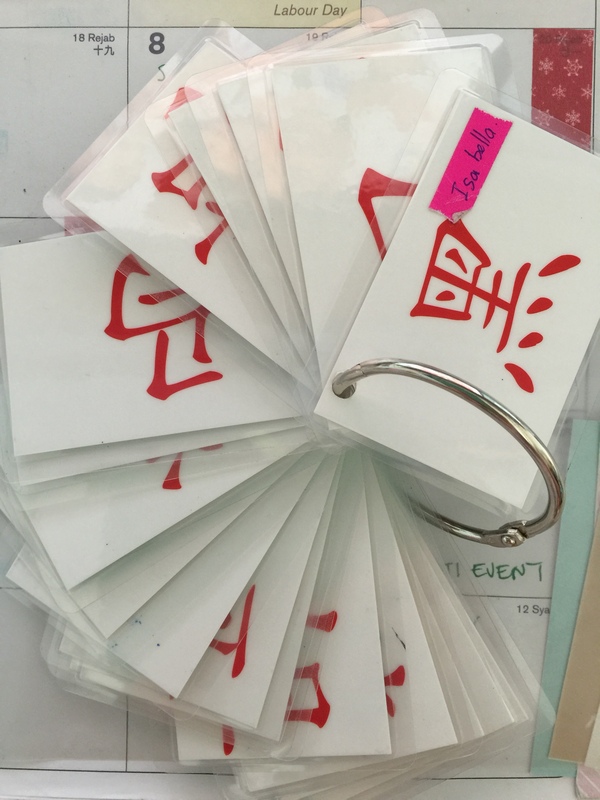 Interesting way of making flash cards… might try that with my kids!